Fans of the short one-eyed Stuart Minion from Despicable Me will love this talking, laughing little Minion with the warm brown eye and neatly combed hair. 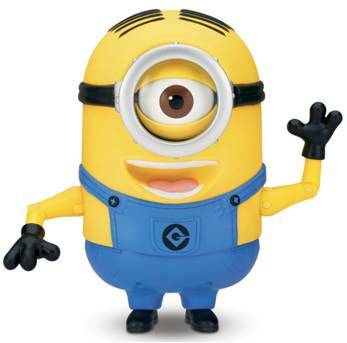 This adorable little action figure brings to life the playful nature of one of the most innocent in the Minion clan. Familiarly outfitted in the iconic denim looking blue overalls, this Stuart action figure is sure to keep you in stitches with his fits of giggles when activating his LOL (laugh out loud) mode. This is just one of the features that make the 8-inch Minion a cute toy for Despicable Me and Despicable Me 2 fans and merchandise collectors. Minion Stuart is one of the shorter Minions and made his debut in Despicable Me when asked by Gru to keep Agnes, Edith and Margo away from him. Stuart gets into some serious mischief with the girls by throwing toilet paper all over the living room. In Despicable Me 2 Stuart, along with Minion Dave, are undercover with Gru, in the cupcake shop at the Paradise Mall. He is also the Minion pushing the accelerator pedal on Lucy’s car when he and Minion Dave rescue Gru and Lucy before Eduardo catches them at his restaurant. With his authentic movie voice, this quirky little action figure is sure to delight Minion lovers of all ages. At an impressive 8-inches tall, this Stuart Minion action figure is large enough to get noticed but also at a comfortable size for smaller hands to take full advantage of Stuart’s features. From his soft rubber-like skin to his posable arms and legs, Stuart can assume any number of different positions while delivering familiar sounds and phrases. Minion Stuart looks just like his character from Despicable Me. He has a sincere, warm brown eye, the iconic denim look overalls worn by all the Minions with black shiny shoes and black gloves. His hair is neatly combed (painted on) and parted in the middle. He also has the authentic sounding voice of his movie character. The “Gru” emblem is featured on a center overalls pocket. Stuart’s hard plastic arms are posable. His shoulders have ball joints, his elbows have hinged joints and hands swivel for any number of poses and gestures. His feet can be turned for a number of different stances and he is self-supporting meaning that although he appears top heavy, he easily stands on his own. Pressing the “Gru” emblem on his overalls pocket will get him talking. Move his head from side to side and you will see his eye move in the direction of your tilt. When you tilt his head back his eye lid will close. He says “BeDo” just like Minion Carl during the Despicable Me 2 scene when Gru sets fire to the telephone on his desk. Fireman Stuart is the Minion hosing Carl down with a fire extinguisher during that scene. This Stuart Minion action figure has a unique LOL (laugh out loud) mode that the other Despicable Me action figures do not have. You can put Minion Stuart in LOL mode by pressing his overalls pocket in succession 6 times — any way you move him then sends him into fits of giggles that will get you laughing right along with him. With over 45 sayings and giggles this playful and funny, video game-loving Despicable Me Minion seemingly comes to life. Stuart runs on two (2) AA-Alkaline batteries that are installed at his base. Batteries ARE included with purchase, however, these batteries are for in-store “Try Me” purposes only. For all the features to fully function, fresh AA-batteries should be installed as the demo batteries are not full strength. Stuart needs a little love in return for plenty of laughs. As one of the most sincere, yet innocent of the Minion clan, Stuart is often bullied and teased by other Minions in the Despicable Me films. He can certainly hold his own as an action figure with his adorable, infectious laugh and is the ONLY Despicable Me action figure with the LOL (laugh out loud) mode of play. At 8-inches tall with over 45 sayings and sounds, he is a good value as an action figure, conversation piece, collectors item or just a fun little yellow buddy to have around when you need a smile. Despicable Me Stuart is officially licensed merchandise that has been made outside the US and is imported. Pricing for Stuart has been determined by the supplier and not this website. Pricing WILL change based on product availability and popularity. You might also be interested in our reviews for talking Dave, conversational Gru and talking Minion Tim.